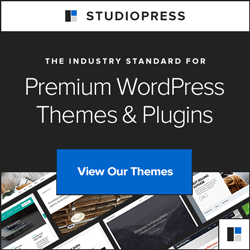 Studio Press is the home of the popular Genesis Framework for WordPress. There are currently over 100,000 active bloggers using the Framework today. Even popular bloggers such as Darren Rowse from Pro Blogger know the importance of using a great Framework for their blogs. Let me go through and explain the 8 reasons why you should switch to using the Genesis Framework for your own WordPress blog today. As a blogger you already know the importance of SEO – Search Engine Optimization for your site. You want to make sure your website is formatted correctly and easily readable by search engines. With the Genesis Framework you get built in SEO controls that rival the top SEO WordPress plugins. It is ready ‘out of the box’ to be SEO Optimized to help your blog get found in popular search engines such as Google, Bing, and Yahoo. With many people switching to mobile devices such as tablets and smartphones it is important that in today’s mobile world that your website looks great on any device. In the past you had to create a custom mobile website version, create a separate application, or use a special WordPress plugin for mobile users. With StudioPress 101 and Genesis you get a huge selection of Child Themes that utilize responsive design and HTML 5. You no longer need a separate application or plugin to display your site for mobile users! Using a Responsive design ensures that your site will look great from anywhere whether visitors are using their computer, tablet, or smartphones. Other WordPress Frameworks you start with purchasing the Framework then are charged for everything else. Or you get support and updates for a limited amount of time. When you purchase from Studio Press you pay one low price that gets you unlimited support, updates, which you can use on multiple websites/domains. No hidden fees or special terms involved. In today’s internet it’s important that your WordPress site is secure from exploits and hackers. With WordPress there are always new vulnerabilities and exploits out there that hackers are looking to take advantage of. Studio Press has a dedicated WordPress developer Mark Jaquith to make sure that the Genesis Framework adheres to WordPress security best practices so your site will always remain safe and secure. Unlike other WordPress Frameworks that force you to manually update your site by uploading zip files or manually updating your theme and then pray that it all works. With the Genesis Framework they take away all of the worry and guesswork of having to update your WordPress site. Whenever an update is available it will notify you in your Administration Panel. Then it’s as easy as updating a WordPress plugin. One click and you’re done. With the Genesis Framework you get the best of both worlds. Light weight code that is sure to run fast and all the features you could want. From multiple Widget screens, the ability to easily add advertising, multiple theme options, and built in comment functionality. If you wish to add additional features or custom code to your site? Studio Press has a very active forum and a large index of tutorials that will help you walk through on how to add that additional functionality to your own website. Other Themes offer you a ridged strict environment. What you see is what you get. What if you want to use different layouts for posts or pages you create? What do you do then? Get yet another WordPress plugin that might or might not work? Genesis offers you the customizations to both your widgets and your layouts. Now you can easily mix and match how you want your site to look from your front page, sidebars, to your blog posts. Easily change the layout design of your site without the need for another plugin to do the work for you. In today’s competitive online markets it is important to make an impression. You want your website to stand out from the crowd. Although Studio Press offers great Child Themes that are ready to go out of the box. Sometimes that just isn’t enough. If you are looking for a web developer to work on your next project? Studio Press has a great list of developers that you can trust to get the job done right.